Like a caffeine addict on speed! Your peon has returned to ask you some questions. This time, however, he shall not pose them in a numbered list. Instead he will direct one query to each of the Seven. See if you can handle it. Deezer: If a genie were to give you two wishes, and you could not wish for more wishes, what would you wish for? MEGAß¥TE: What is the most effective way to flatter you? I'm doing research for Luigison. J. J.: Do you say "eh" a lot when you speak? David Dayton: Will you drive a big ol' Ford pickup with a pink interior to E3 this year? Chupperson Weird: If you found a Huuuuuudge sitting on some Chup in your shower, what would you do? Sapphira: Do you think the mailbag section would be improved if you drew a picture/icon for it depicting you smashing or bagging the rest of the staff with the mailbag? Lizard Dude: What have you learned about science from World of WarCraft? Oh, and I'm the peon. Wish #1: Infinite knowledge. Wish #2: Infinite riches. Pretty boring, I know. David Dayton: What in the -world- inspired you to ask such a question? Chupperson: Build my own zoo. MEGAß¥TE: You could have a small country named after me. Yuji Naka supposedly said it'd be likely for a sonic-mario game or at least a cameo. What do you think about this? David Dayton: "It"? Whatever are you talking about? In any event, I'm not overly fond of a Sonic appearance in a Mario game... unless he appeared in the new Namco/Nintendo arcade Mario Kart title, along with Pac-Man. MEGAß¥TE: It's almost inevitable. Maybe Naka will finally get his wish in SSB3. Lizard Dude: I wouldn't mind. It would be interesting. In Super Mario Brothers 3, do you happen to know what the kings of the Mushroom Worlds' names were, other than "the kings"? I mean do they have names like Fred or Louie or something like? If they do have names, where/when was it stated? I know that their names aren't stated anywhere in any of the American versions of the game, but maybe in a manual or strategy guide..? David Dayton: I don't think they were given names. Deezer: I am yelling at you for not sending this to the sightings section. Anyway, it's not even close. David Dayton: Overalls aren't enough to make something a Mario reference. Lizard Dude: A creation from a stereotypical mold becomes the mold itself. 1)Am I the only person who thinks it's really stupid that Wario is in SM64 DS? I mean, c'mon, why would HE want to help Mario? At the time, they were worst enemies! It's like King Boo and Luigi going out for a beer together. 2)Speaking of King Boo, in Luigi's Mansion, is that supposed to be a Bowser costume, or the real deal? Cuz it looks too realistic for a costume, yet too....unreal to be him. Just thought you could clear this up. 3)Why do Mario and Peach act so suprised when they find out about Bowser having a son in SMS? I mean, they already knew of the 7 other children, what was so special that time? And why don't the Koopa Kids help Bowser Jr. on his quest? Are they jealous of him, or what? I've always wondered how they reacted to him. 4) Am I the only person who noticed King Boo changed drastically beween 2001 and 2003. I mean, in Luigi's Mansion, he looked genuinely scary! He glowed blue, and had bright red eyes. I was seriously intimadated! But in MK:DD, he looks like a friggin cream puff! He's white like a coud, and looks like a Goomba could deck him! What happened? 5)Boolossus vs. Petey Pirhana:Who would win? I personally think Boolossus, because he's HUGE, and was really hard in LM. What do you guys think? 6)Got another one:Wart vs. Tatanga. I think Tatanga, because he's got that really fancy spacecraft, and could shoot that toad dead. Again, what do you guys think? 7)WOuldn't it be cool if there was a game completely focused on Bowser? Maybe Wario and Waluigi took over his home land, and Bowser stops them. Or, he goes to kill the Mario bros. Same with Waluigi. Isn't it time he got his own game? The most exciting thing he ever did was drive a nice car. I think it's time he had a game. David Dayton: I liked SM64 DS, so I'm not the person to argue with you on this point. I have no idea what's going on in Luigi's Mansion... perhaps a robot body? The Koopa Kids are almost forgotten these days, although they did reappear in Superstar Saga. Waluigi had a few minigames in the Mario Party-e game, you know. Chupperson: 1) Wario can't jump. 2) It was a magical scary Bowser suit. 3) They didn't have full motion video cutscenes when SMB3 came out. Maybe if they did, Mario and Peach would have acted surprised. Who knows? 4) King Boo looked terribly stupid in SMS, also. He looked awesome in Luigi's Mansion though. Sapphira: 4) Perhaps they're different King Boos. *shrugs* It seemed ALL the standard Mario enemies that appeared in SMS looked ....warped. Maybe it's Isle Delfino that did that...it seems to have weird effects on creatures, i.e. the Yoshis "melting" when they enter water. That wouldn't happen to "normal" Yoshis... Hmm...I've gone off-topic now, so I'll stop. Yes, King Boo's appearance in LM was awesome. 5-7) Ugh, no more questions. Lizard Dude: 1) Wario'll show up wherever treasure is to be found. 3) Because he said that he was the son of Bowser and Peach. 4) I didn't really notice. 5) Petey Piranha, because he has more experience. 6) Tatanga. Space technology beats the power of vegetables anyday. 7) A Bowser game isn't a bad idea. WHY is wario always smiling? I bought Ww:touched the other day and althroughout the game i noticed that guy never stops showing them purly whites. .....I think it would be cool if Nintendo re-made Donky-kong only this time in 3D. Do you agree? David Dayton: Wario is greedy, and is always smiling in anticipation of finding his next pile o' treasure. Sapphira: He frowns when he loses in the Mario Party games--his character icon, not the polygon model. I don't know if a 3-D version of classic Donkey Kong would work very well... unless it was something crazy like a dance mat version. David Dayton: I think the use of "world" is somewhat symbolic as opposed to literal. Chupperson: The myriad worlds in SMB, SMB2j, SMB3, Yoshi's Island, and elsewhere, are all part of the Mushroom World. P.S. Sapphira, now I know how you feel when people fail to realize your a girl, even though your name is waaay obviously feminine while mine's really not. Sapphira: P.S. Heh, thanks. It's annoying, huh? >_< I did suspect you may have been a girl, but I wasn't sure. Lizard Dude: Anyone who signs their letters with a rose gets logged as a girl in my books. David Dayton: Daisy is "fat" in MGTT? That's news to me. Sapphira: I like Daisy; she's cool. I agree, though; I like her appearance in the N64 games better than in the 'Cube games. Her new dress design and the change of her brooch and earrings is just....ugh. I like both of her hairstyles, though. But her face...it used to be so much prettier, although I like that the irises/pupils of her eyes are bigger now...other than that, no. Naw, I just can't picture Mario and Daisy together. 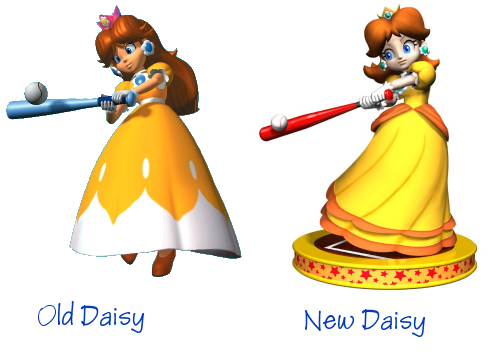 And I do think it'd be cool if Daisy at least made a cameo in a Mario adventure game. 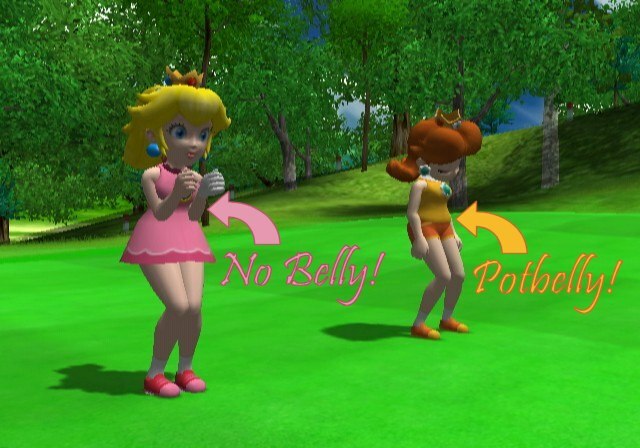 MEGAß¥TE: David obviously hasn't seen my potbellied Daisy screenshot. 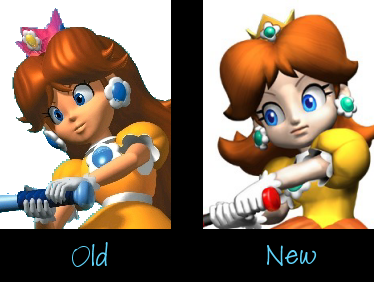 I'm not sure why Nintendo uglified Daisy recently either. They made her face look like she has fetal alcohol syndrome or something. Actually, I didn't like her N64 model either. Deezer: Hmm, Daisy got an un-tan. Hi Hi its Tv_Themes and I have a few questions and or statements I wanna make. 1) I don't care about the secret page so I don't even try to look for it. 2) I was playing SM Kart for the SNES the other day but the game crashed and got all scrambly and I could make out a little Yoshi on a cart thing, could this be an unused sprite? 3) Did any of you ever watch the Super Mario cartoons? 4) You should make a beta section on the games page, why? Because that stuff interests me. 5) Do any of you own a Famicom? 6) I wish my NES would work better, I really want to play old SMB3 but it keeps crashing. 7) Has anyone seen what could possibly be EGM's next April fools joke? It says that as a pre-order bonus for the next Legend of Zelda you get LoZ: WW in the same style as the new Zelda. Do you believe this? 8) In SM Kart for SNES, what is that thing you get for winning the gold cup? It looks like champagne to me. 9) Do you think that the guy who beat SMB 3 in 11 minutes cheated to do that? David Dayton: You can shrink in SMK, you know. That might explain the Yoshi part. The Wind Waker thing is just a joke by EGM. Chupperson: 6) Clean your NES. 9) He stopped and started the recording many times. We've already been through this. Sapphira: 3) Hasn't this been asked before? I watched one of them when I was really little, but sadly, I don't remember it other than the fact that I watched it. 3) Yes, all of them. 7) Yes, despite the fact that it came out in February, that was an April Fool's joke. It's getting to be like sports games or car models. I have a question. Why do you think Nintendo doesn't come out with many Mario games per system anymore? for the NES they had 3 Mario adventure games, the SNES had 2 or 3 I don't remember. Then they go to the N64 and they make one. Don't get me wrong Mario64 is still amazing but why didn't they make any more titles? If I'm not mistaking that was the release title for the N64. Now for the gamecube they have Super Mario Sunshine, a game I like but I would like to see a new Gamecube Mario adventure game. I think they are wasting too much on all the Mario Spinoff games, Now I love alot of them but I'd rather have 2 Mario Adventures than 3 Mario Party games. The Gamecube does have Luigi's manshion but that's a differnt kind of game. It doesn't look like there will be a new Mario adventure for the Gamecube. Wouldn't you want a new Mario adventure without having to wait for the new system? Or is this the way they keep mario games fresh by making one per system making you want to buy a system? Anything annonced? David Dayton: In Japan, there were really only two unique Super Mario Bros. titles on the Famicom/NES: Super Mario Bros. and Super Mario Bros. 3 (SMB2 was more of a disk system "special version" of SMB). The Famicom got as many Mario games as it did because of its rather lengthy life as a system... the newer Nintendo systems have had a much shorter life span, and as a result they have fewer Mario titles. Chupperson: SMB2j had all new levels and Luigi with different physics. And some different graphics. MEGAß¥TE: I do agree that I'd rather have more traditional Mario games than all these spin-offs, and I think Nintendo does plan to have more than one per system, but they never finish them in time before the next system comes along. David Dayton: I'd like to see a "Mario Classic Games" collection for the DS, featuring chess with Mario themed figurines. MEGAß¥TE: So basically you want a DS version of Mario's Game Gallery. Can... you... DIG IT?!?!? Heh, sorry about that. I've been watching too much American Idol lately. So anyway, I'm not going to drag you down with any huge lists or apologizing this time (sorry I do that so much) but just wanted to ask three short questions. First, there is something that I must know right now or it will kill me. Okay... one day I was in my room and about to make my bed. I noticed that my brother had put my 007 game case on top of the TV and I checked to make sure that he had put away SSBM back in the case (because he usually forgets). I opened it and saw it there surprisingly, but when I closed the case I began to look at it and suddenly spotted something unusual. On the front of the box, and on Mario's right button, there is some kind of strange reflection. It looks like someone's face but I can't quite tell. It must be a face! But who's? Can anyone make this out? Lately I've been thinking a lot about names and what they mean. I don't mean like real names but those crazy user names that everyone has. How did they think of them? What do they mean, if anything? I already know about how Dan and David D. got their user names, but what about the rest of you? (does Lizard Dude like lizards?) For me, I just picked a name involving Yoshi because I almost always play as him in the multi-player mario games and really like him. At first I called myself Yoshidude but several years later I found out that name was already taken so I decided to think of something else more unique. Somehow I thought of a tyrannosaurus rex (probably soon after watching Jurassic Park) and combined that with my character to get Yoshisaurus. The name was both too long and interesting, and I didn't like it at first, but then it just grew on me and now I would never use any other name (except maybe Yoshinator or Bob-oom or Wadeezer :)). Sorry if this was already a topic in the FF but I'm interested to know. What about you? Why are you who you are? Now for my less important and slightly dumb third question. Do you think that if Nintendo ever made a system that could play all NES, SNES, and N64 games, that anyone would actually buy it? (I would in a heartbeat!) Well that's all I had to say for now. Peace out, paisanos! D.S. MegaByte, you were right about the numbered lists in my letters making them bad. I'll try harder to make more real letter from now (but I can't promise anything). D.D.S. What kind of bread do you feed Mushroom Boy? White or wheat? David Dayton: I'm confused... on which box did you see the "face", and what do you mean by "Mario's button"? On his overalls? If Nintendo allowed you to play all your older cartridges on a single system, I do think it would sell. I am curious as to what you mean by knowing how I got my name. Chupperson: Come on, David. Everyone knows you love the Daytona 500. As for me, it's very simple. Chup person. A friend of mine made up the name. I already own all the Nintendo systems except Virtual Boy, and I guess Pokemon Mini. Aside from myself, I guess some people might buy it. Sapphira: I see what he's talking about. On the SSBM box, on Mario's right button of his overalls (our left), the way the light relects off it looks sort of like a profile. It's probably just the way the lights shining on it, nothing more. D.S. If there are going to be a bunch of questions, though, I MUCH prefer them to be numbered than all jumbled together. Makes it much easier to respond. Deezer: "Deezer" came from my dad. When I was younger, he would call me "D" for short, then eventually he added "zer" to the end of the D sound. Lizard Dude: I needed a name to use for my first online PC game, HoverRace, and pretty much arbitrarily chose Lizard Dude. I have no especial fondness for lizards. A bit later, I used Lizard Dude for the online matchmaking service, Mplayer, and it stuck ever after. One of the default avatars on Mplayer was a dude with scaly green skin, which I used. The Play-It-All system would raise some interesting issues about actually rereleasing old games in their original form. It would also devalue classic ports to modern systems. Chupperson: If people don't know what Chup is, they need to look around at the craze sweeping the globe. MEGAß¥TE: When I first logged into a chatroom in 1996, I needed a nickname and wanted one relating to computers since that was what I was most interested in. I chose "byte." Well, I logged into this room from a public library, and somebody I met there decided to use my nick and get a bunch of people mad. Because of this, I "upgraded" my nick. I started to use Meg@byte, with the @ so cleverely replacing the a, but too many people just read the Meg part and assumed I was female, so I decided to change the characters in my nick. Weird extended ASCII characters were popular at the time, but I still wanted my nick to be readable and not have any overhangs or accents (so it could fit nicely in a rectangle for a logo). It so happens that the two characters that I chose are also representative of my background. I have Japanese and Polish ancestors. The ¥ in my nick obviously represents the Japanese side, being the Japanese unit of currency. The ß is part of the German language that represents a combination of the letters s and z. "sz" is common in the Polish language and also happens to be found in my last name. As for the face on Mario's button... I don't have my SSBM case with me, but from looking at the (poor quality) ones online, it seems like it could be the reflection of Samus's helmet. Incidentally, you can see a reflection Yoshi's Island on the Metal Mario trophy and a reflection of a scene from Super Metroid on the Metroid trophy. My friend, who is also a Mario fan, told me that Mario and Nintendo are going out of style and that no one would like Mario in a couple years. Could this horrible travesty be true? If Nintendo goes out of bussiness I would be out of my mind. I would have to play those other games. I don't like those games with shooting and swearing and killing zombies. I like the good old games with things like monkeys wearing ties and pink balls eating stuff and..........middle-aged overweight italian men with mustaches. David Dayton: Mario will never die... not as long as he can stomp on turtles nine times or more. Chupperson: Why would you be forced to play new games? 1) In the January 18th Mailbag, I heard from MegaByte that Nintendo is making an anime version of Super Smash Bros. for the Nintendo DS featuring the Shonen Jump characters. I searched everywhere for info but found none. Where have you found this out? 2) Why does Sapphira think I'm freaky? Chupperson: Mr. EAD is not Mario. That's what I think. MEGAß¥TE: 1) The game you're looking for is Jump Superstars. The info is everywhere. Deezer: 3) I don't think it's a cameo because Mr. EAD is only based on Mario.